I’m in the process of double checking all of my Morgan info as I get ready to put it all in book form. 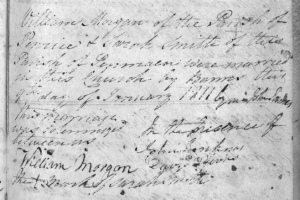 One of the biggest frustrations for me was not being able to find a baptism for John Morgan who was born c. 1730. Today I was at the local LDS FHC looking at some church records that are available online for free at the center via findmypast. I started doing some random searches for possible John Morgans and made a very promising find. 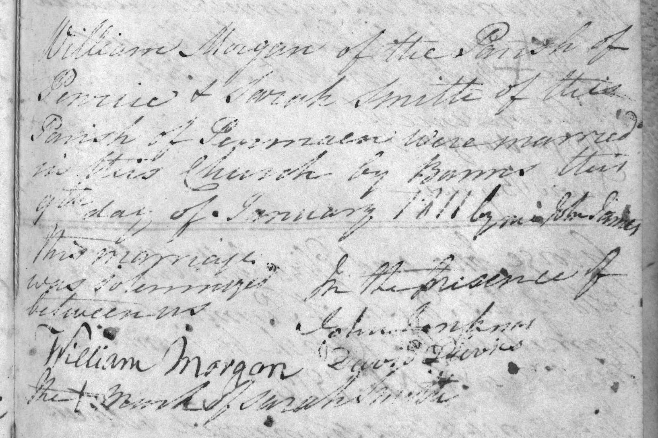 There was a John Morgan baptized in 1730 (no date) in Reynoldston, Glamorgan. Reynoldston makes sense as a location, especially since John married Sarah Gammon and the Gammons were mostly from the Scurlage area. Scurlage is just a bit southwest of Reynoldston. John and Sarah named multiple sons William which makes sense if that was his father’s name. Also, in the early 1800’s, John and Sarah’s son William was living in Reynoldston. I also discovered siblings for John Morgan of Reynoldston’s. They were sisters Anne Morgan bp 1728 and Elinor Morgan, bp 1733. I don’t have positive proof that this is our “John of Moor Corner”, however, it is the first record I’ve found that fits with data that I have proved. This means that John may have been the first of our Morgans to live at Moor Corner. I made another discovery today involving the son of John Morgan, William, “of Penrice”. Up until now I didn’t have a surname for his wife, Sarah. I found the marriage record (see image) for “William Morgan, of Penrice” and Sarah Smith on 11 January 1811 in Penman. I also found a baptism for a Sarah Smith, daughter of Richard and Elizabeth, on 8 March 1779 in Penmaen. William and Sarah named one of their sons “Richard” which would make sense if her father was also Richard. I’ve updated information on my John Morgan of Moor Cornerpage.